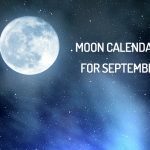 What does the lunar calendar for September 2018 have reserved for us? How does this month cycle influence our life? Here are the recommendations of this month’s lunar calendar. This phase of the lunar calendar for September 2018 will begin on 02/09 at 00:00. It is a moment of reflection and meditation. Excellent phase for activities in which secrecy is recommended. This is a favorable phase for cleansing the skin, haircuts, and all weight loss procedures. Affection and intimacy can replace a greater physical attraction. On the professional level, it’s a good time for evaluations and preparations for a new cycle. On the financial level, it is a positive period to negotiate the repayment of debts, the reduction of interest or a savings plan, aimed at reducing the due amounts. According to the forecasts of this lunar phase that will begin on 09/09 at 6:33, there will be an abundant energy to create new parameters and new ideas, at work, in love and in life in general. It’s time to take care of yourself, look after your appearance, and renew your look. This is a good time to initiate long-term beauty procedures, as well as a physical activity program. When it comes to relationships matters, it will not be the ideal phase to think about marriage, but a healthy relationship could still arise. All savings projects, real estate purchases for investments and businesses that depend more on an individual initiative than a collaboration, undertaken between September 9th and 14th have a great chance of succeeding. In general, this phase of the lunar calendar for September 2018, which will begin on 16/09 at 14:57, is a favorable period for projects already in progress and which require energy. The elements are coming to an end. This period makes it possible to advance the chances (sentimental or professional). You simply have to continue all the actions taken at the new moon. This First Quarter invites you to an awareness and responsibility in your actions. Go in one direction and even change direction to agree with yourself. Conflicts could arise. Everything will depend on the state in which you were at the new moon: you can settle these conflicts to continue your actions that do not necessarily please everyone. The adage “we harvest what we sow” adapts perfectly to the full moon which will begin on 24/09 at 20h19. The emotions, intuitions, psychic and emotional responsiveness are amplified and we will have to master them. Everything appears amplified and the state depends on the beginning of the lunar cycle. If you are satisfied with yourself, the full moon will be magical and harmonious, whereas if you feel bad, the moon may seem dark to you. You may have trouble sleeping during this time. You will have dreams that you may find odd or prophetic. Enjoy these nights for an awareness, a questioning and especially for the internal questioning. Watch out for thoughtless actions. This phase is also recommended to increase one’s psychic gifts, extrasensory abilities and spirituality. Searching for the calendar for another month?